It may be hard to believe, but there is no better time in American history to make a big splash in the cannabusiness. If you’re wondering how to earn top dollar in the marijuana industry, look no further. We’ve compiled some of the best tips and tricks for securing yourself that awesome cannabis career you’ve been searching for. The kind of money earned by cultivators, extraction technicians and others under the legal industry might not be as high as some black market payouts, but that is largely based on the fact that illicit income is untaxed. Regardless, careers are cropping up all over the country, offering qualified individuals the chance to use their unique skills to make a pretty penny. Discovering how to find a marijuana job can be a difficult enough process on its own, especially if you live in a smaller town or city with less cannabis opportunities available, and landing a high paying cannabis industry job will add even more difficulty to the mix. However, don’t let this deter you if you are determined to break into this industry. Remember, determination will get you through anything! Here are six key steps to help you not only land a job in the marijuana industry, but earn top dollar in the field. In past articles I’ve written on this subject, I’ve placed this tip further down on the list. Now more than ever, I’m realizing just how important it is to have connections in the industry. Whether you’re looking to start your career in budtender jobs at a dispensary, or you’re hoping to lead a grow operation after assisting for years, it pays to have another industry professional in your corner. The history of cannabis cultivation, processing and sale has been predominantly under the illicit market. Because of this, most individuals acquired jobs by knowing other growers, trimmers or sellers. Even as the industry has been embraced by legalization, the trend has continued. Additionally, since there is so much interest in the cannabusiness, it can be extremely taxing for employers to sift through hundreds of applications when they know a friend who is qualified and trustworthy. this kind of nepotism may be annoying, but it’s the reality of the business. While you can’t (and shouldn’t) force friendships with cannabis professionals, it definitely helps applicants to insert themselves into local cannabis culture and get involved with the scene. From here, job seekers are more recognized among the masses of cannabis enthusiasts and have a greater opportunity of meeting other professionals and finally standing out from the crowd. Something else I can’t stress enough to job seekers wondering how to earn top dollar in the marijuana industry is to know your cannabis related laws. Not only does this include knowing what kind of marijuana is legal statewide, it involves having an in-depth knowledge of the specific compliance measures and regulations exist federally, statewide and on a local level. Additionally, it’s important to know the specific measures that apply to your individual cannabusiness sector. For instance, while most jobs prohibit on site consumption, some of the rules that apply to dispensaries will be irrelevant to extraction technicians. The reason it’s so important to be aware of cannabis laws is because the industry as a whole receives an especially high rate of audits, raids and suspicion from the government. If any of the cannabis governing boards find that a business, or even a specific employee has been breaking the rules, the employees involved and the business are at risk of receiving major fines, being closed down, or even put in prison. It’s difficult enough for cannabusinesses to receive licenses, so employers don’t want to risk hiring individuals who aren’t super up to date on all necessary legislation. This might be a no-brainer, but don’t underestimate how important it is to know about cannabis itself. Especially if you’re looking at how to earn top dollar in the marijuana industry, it’s integral to know the variety of cannabis strains and ancillary products popular in current culture. A necessary distinction to make clear is that smoking cannabis regularly doesn’t make you an expert. While there are plenty of people who are experienced in consuming cannabis, far less are equipped with the science and specifics behind strains, concentrates and more. In addition to knowing about the product itself, job seekers should have an idea how the product is processed and cultivated. Arguably even more than cannabis knowledge, a genuine passion for cannabis is looked at as the most important element for a cannabusiness worker to possess. Especially when starting your career with entry level marijuana jobs, passion can make up for any holes in cannabis knowledge that you may have. It is essential for everyone in the industry to actually care about what they are growing, processing and selling. The history of cannabis in the United States is riddled with prejudice against minority groups and medical patients, making it ever-important to be an advocate for the plant that is responsible for your employment. One of the best tools at a job seeker’s disposal are educational resources. There are several different educational paths one can take to achieve cannabis industry success, from traditional classroom college education, to online cannabis job training services. In the case of the former, there are plenty of fields of study that can equip academic stoners with the knowledge and credibility necessary to maintain leadership positions in legal marijuana jobs. Cannabis extraction technician jobs for instance, require applicants to have degrees in chemistry or similar science. In keeping, master growers and other cultivation staff often have degrees in horticulture and agriculture. Continuing on, marijuana edibles chefs frequently come from culinary schools; cannabis consultants have advanced law degrees, and the list goes on and on. When it comes to job training resources, sites like THC University and Trim Ready offer online courses that teach job seekers everything they need to know about cannabis jobs. While there isn’t any direct interaction with cannabis itself, these interactive services arguably prepare potential applicants in the most direct way possible. Although there are not any unanimous governing boards standardizing cannabis job training certifications, having any certification in general shows a willingness to prepare for the job. #6 Work Your Way Up! In a perfect world, finding success in the cannabusiness would be an easy, one step pursuit. However, the reality of how to earn top dollar in the marijuana industry is that it’s a path requiring dedication and perseverance. It’s not uncommon to start working as a budtender, only to see your credibility and experience level grow alongside raises and promotions. It may not be an immediate process, but finding success in this industry is a path worth taking. As the legal marijuana industry is given the opportunity to get its footing, more and more well paying marijuana jobs are offering sustainable careers to the cannabusiness’ most passionate potheads. 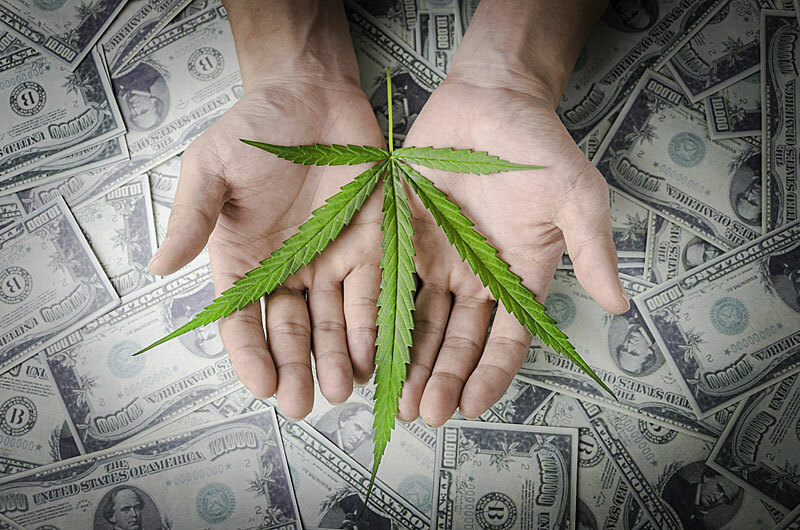 As you can see, how to earn top dollar in the marijuana industry is not a simple pursuit. It is likely on your journey to industry success that you will face hurdles based on intense competition from other job seekers. The important thing to remember, though, is that the most successful members of the business persevered past all the hurdles and difficulties, eventually securing their place as one of the industry’s top players.